This Roasted Cabbage Wedge Salad encourages you to skip the iceberg lettuce and make your next wedge salad with cabbage. Roasting it adds extra flavor! I have a fun little guest post for you guys today courtesy of my friends and fellow RDs Deanna & Serena who blog over at Teaspoon of Spice! I had the pleasure of meeting Serena last year at FNCE and am looking forward to hopefully meeting Deanna this year! They are bloggers, business partners and wonderful ladies that inspire me every day to be a better dietitian! Today they’re sharing a fun twist on a classic recipe. I can’t wait to make it for the hubby! I’m super honored Lindsay asked us to guest-post today! She’s been such a wealth of info for Deanna and I, not to mention, her recipes rock! So…you know how it goes when you’re out to eat: You’re waffling between two items on the menu…you choose the first one and your friend chooses the second. The waiter brings out the dishes and based on appearances alone, it’s completely obvious you made the WRONG choice. That’s exactly what happened to me recently when I ordered the Mediterranean Salad, and my friend ordered the Iceberg Wedge Salad. Once we were served, I immediately had “order envy” over her salad blissfully covered with bacon, large crumbles of blue cheese, a thick creamy dressing and fresh green chopped chives. Totally splurge worthy, in my book. So, having missed out on all but a bite or two of that wonderful Wedge Salad, I set about to recreate it with a timely ingredient for March: Cabbage. 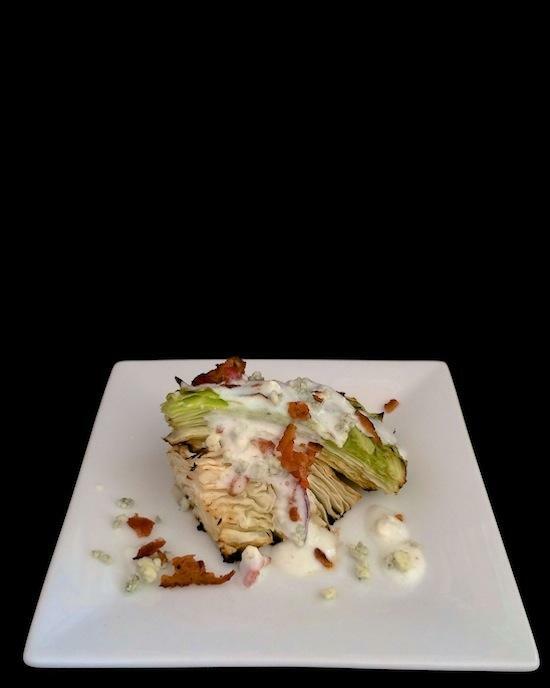 The traditional Wedge Salad begins with a sliced wedge of iceberg lettuce. The common perception is that iceberg lettuce has no nutritional value whatsoever. But as a dietitian, while I know iceberg is lean on nutrients, I tend to think of it as a ‘vehicle’ food: A food upon which other more nutritious foods/veggies can be sprinkled – and then it is happily eaten by my kids. I keep it in the fridge almost all winter long; my kids like it shredded with carrots, apples and Maple Apple dressing – or in soup. And have you noticed the price of cabbage this time of year with St. Patrick’s Day around the corner? Supermarkets try to outdo each other with sales on this cruciferous veggie. So I thought I’d try pumping up the nutrition of the classic Wedge Salad – by roasting cabbage wedges instead – and bumping down the calorie count by creating a healthier dressing. A tender-crisp wedge of slightly sweet roasted cabbage with a super creamy yogurt-based blue cheese dressing. Bacon is still boldly sprinkled on top – along with chives or green onions. Deanna also tested this recipe (she took the photos, too) – and she reported back that she’s a cabbage convert after tasting the salad. Since making this, I’ve roasted more cabbage wedges and topped them with a simple vinaigrette, chick peas, olives and sundried tomatoes. I don’t think I’ll have salad envy again for awhile. 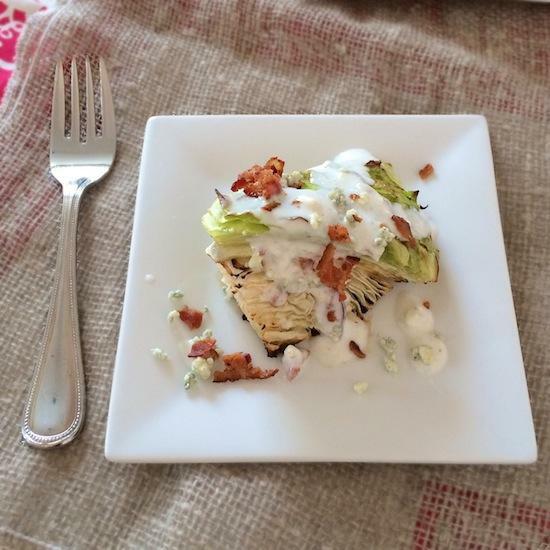 A tender-crisp wedge of slightly sweet roasted cabbage with a super creamy yogurt-based blue cheese dressing. Preheat oven to 400Â°F. Line a roasting sheet with parchment paper or grease with oil. For the cabbage, slice wedges so that the base of each wedge is about 1 1/2-inches thick. If you start with a 2 1/2 pound full head of cabbage, and use half of it for this recipe, you will have 5 or 6 wedges. Roast 30-35 minutes for tender-crisp. Reassemble cabbage wedges and cool or chill in the refrigerator. Meanwhile, whisk together mayonnaise, yogurt and buttermilk. Stir in nearly all the blue cheese and nearly all the bacon; reserving a few crumbles of blue cheese and bacon for topping. To assemble salad, place wedges on individual salad plates and divide dressing among salads. Top each salad with a few crumbles of reserved blue cheese and bacon and with chives. Big thanks to Serena & Deanna for filling in for me today! Be sure to check out their blog for more great recipes. Let’s chat: Are you a cabbage fan? Yay or nay? Obsessed with cabbage! I throw it in everything. I threw some purple cabbage in my fried rice the other day and, the whole dish turned purple! I was having a hard time to push my kids to eat cabbage . Wish this recipe will change their taste buds. NOT a cabbage fan! My family is Polish and always makes cabbage soup for Christmas and ever since I have been little I refuse to eat it. I did however recently start trying to incorporate Kimchi. There’s a lot of flavor with it, so maybe I will be able to eat regular cabbage some day soon! I know its so good for you too. YAY! roasted cabbage is so good!!! I do like cabbage but unfortunately I’m the only one in my family who does. I will keep trying, though and hopefully my husband and little ones will come around. This recipe may convert my husband! I love cooked or roasted cabbage… not so much raw. This looks so yummy!! I LOVE roasted cabbage but have never though to turn it into a “salad.” I am totally going to try something similar, but veg-friendly! I can’t wait to try this! 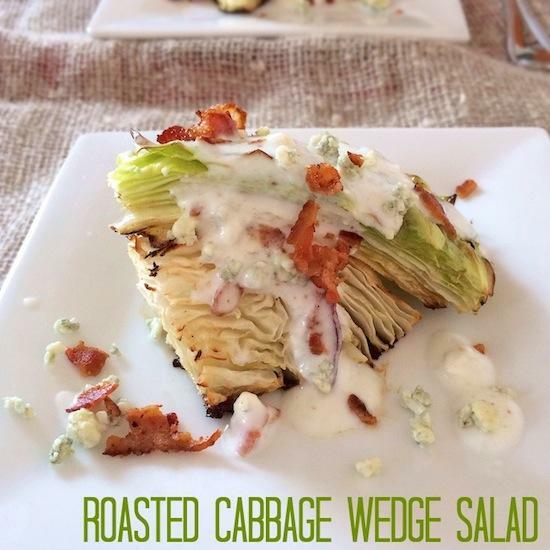 Wedge salad in one of my all time favs, and I’m always struggling to get creative with how to use cabbage. Thanks! That looks delish! Roasted anything tastes so good! I’m not generally a fan of cabbage – it wasn’t something I ate much of growing up – but this looks way too good not to try! Delicious!! Nice work ladies. Love the iceberg/vehicle reference. I love cabbage & I love blue cheese, but I’m a little skeptical about the two taste together. I will definitely have to try this, soon. I would SO eat that! Excellent recipe! I love cabbage, but I don’t know many options of cooking. Usually I cut it for salads or I extinguish. It quickly bothers 😉 Definitely has to try this recipe! Mmm looks nice, i will try this right away. I will definitely try this recipe. DH and I are both cabbage lovers. I like to saute chopped onion and cabbage until soft and lightly browned, then served with soy sauce and/or lightly browned noodles. [WORDPRESS HASHCASH] The comment’s server IP (184.168.46.184) doesn’t match the comment’s URL host IP (50.63.37.1) and so is spam. [WORDPRESS HASHCASH] The comment’s server IP (184.168.27.131) doesn’t match the comment’s URL host IP (50.63.98.1) and so is spam.